No, I get roughly 5 kills per game but wins don't count as deaths. My win percentage is currently 44.
the constant pop up t build something is annoying and distractive. I've got 17 wins in Duos and Squads, and they're not all where I was carried. My most recent Duo win I had 5 kills and my partner had 4. In Solo, if I can get a weapon at the start I can often get 1 - 3 kills per game. I've finished 2nd and 3rd several times, but never 1st. Not to stroke your ego too much, but what do you think separates you from the masses (like myself) who struggle, even after putting in tons of hours, to get their first solo wins? I have a good aim to begin with, then I learned to quickly build. As soon as I get shot at, I build. 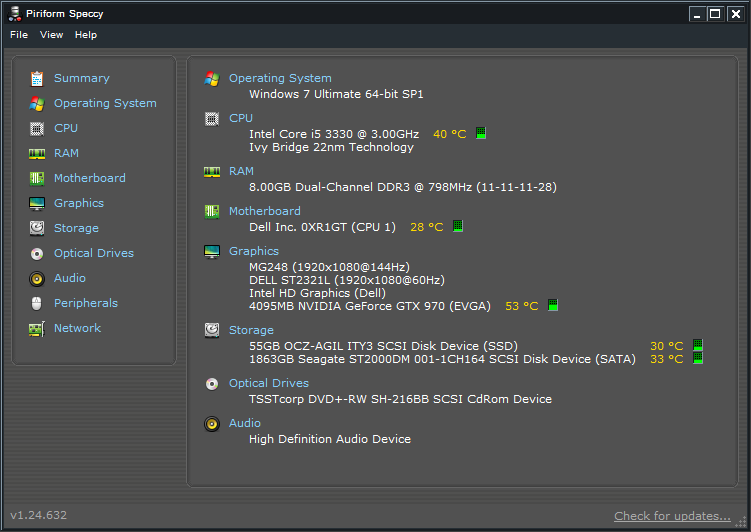 My graphics settings are on the lowest to get the frames I need. What keys do you use for building? I'm struggling with building fast. I'd have to upgrade my os to 10.12 before I'm allowed to play. I need to make a time-machine backup image before proceeding. I fear I'd be alone in the Mac players, since you found the PS4-PC trick. Aim is %90 of my problem. I've been practicing keeping my crosshairs on the players bouncing around on the tires on spawn island. Aren't PC and Mac players on the same servers? What's the PS4-PC trick? I saw NinjasHyper talking about his keybinds. It looks like he has a G502 and has the wall and stairs on the horizontal thumb buttons and the floor on the mouse-wheel with a sideways left click. He says all his other binds are unchanged. I've got all the pieces on my mouse plus the number 2 weapons slot for fast switching. I would love to put more weapon slots on my mouse but I think having the build pieces on the mouse is better for me. I have seen a lot of youtubers that use the scroll-wheel for weapons but I think also a lot use the regular number keys. I'll be up for some 20x5 teams later tonight. I have my building keys on f1-f5, but I have the wired apple keyboard so they're easy to reach. I actually like this keyboard over mechanicals, it's ergonomically superior and I get 110 WPM if I try. It's unfortunately discontinued, but you can probably find them at PC recycling stores or craigslist. I found out Matias makes clones of them, but I can't vouch for the quality (had my apple keyboard for years). Last edited by Anonymous[Lolz]; 03-11-2018 at 05:42 PM..
Q for walls, F for ramps and V for platforms. Are you playing on a Mac? What Mac, and specs? Would you run at higher FPS is you had a overpowered GPU? I have my building keys on f1-f5, but I have the wired apple keyboard so they're easy to reach. I actually like this keyboard over mechanicals, it's ergonomically superior and I get 110 WPM if I try. It's unfortunately discontinued, but you can probably find them at PC recycling stores or craigslist. I found out Matias makes clones of them, but I can't vouch for the quality (had mine for years). Are you using the wired 101 key or the short one without the keypad? The keys feel weird to me... I ended up binding what would be my weapon keys on my mouse to build, and scroll through weapons since there are only 6 slots to use. Not sure if it's best but I am better at it now. Also, I keep trying to dodge jump, but it never works. Tap tap... awww. lame. After a lot of grinding last night I had a 3rd place finish. I pushed a player a little too soon and should have either hung back and spammed him with rockets, or ramped up using side by side ramps instead of a single ramp. He proceeded to get the final kill on a player that looked like a total noob, who I could could have beaten easily. My first solo win is still just a dream. So you're just using a Mac keyboard on a Windows / Dell PC? A GTX 970 should be a pretty solid GPU and maybe run the game at higher detail, but I guess you're going for making sure nothing glitches or lags out due to rendering? You'd rather it be accurate and fast, than pretty? What's your typical FPS? Cool, thanks. I figured out some of that already, but learned some things. I really just wish there was a way to practice melee more... I feel like I get only one or two gunfights every ten minutes... makes it so slow to get better. If they had some sort of deathmatch arena for practice where you could respawn instantly, I could improve a lot more quickly! I am slowly getting better, though. 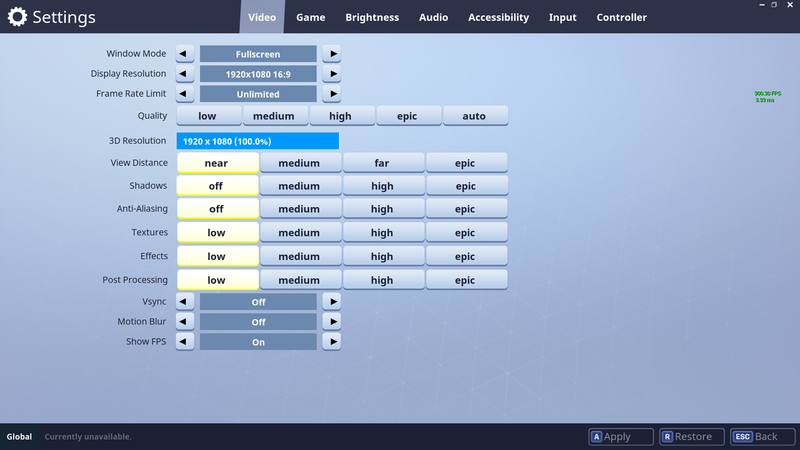 I find it hard to switch back and forth between UT and this, because I use the "invert Y axis" on UT (like flying a plane--push the mouse away from you to go down), but I couldn't find that setting in fortnite so I have to go back and forth between the Y axis inverted and the Y axis not inverted... That's probably good for my brain, I guess. The longer it takes to render a frame, the more latency there will be. If you want to play at a competitive level, you will have to minimize every single source of latency throughout the system. I like the way this guy works with teammates. And he doesn't make me want to rage like Ninja does. Thanks to that video, I got my first sniper rifle headshot kill from a long distance yesterday. I had no idea until I saw the video just how much bullet drop there was. It was satisfying. Ha, I've felt like that a few times!